I know, I know. I’ve kind of been on a cookie tangent lately, but I just found a recipe that was kind of unique, new to us and yummy. I can’t keep something like that to myself. We made Butter Beer last week, which is pretty tasty by the way, and one of the ingredients is butter flavoring. My daughter and I were at the grocery store, trying to read the recipe on my tiny smart phone, and misread the amount we needed. Since I have $12 worth of butter flavoring in the cabinet, I started searching for ways to use it. I came across this one on AllRecipes, submitted by Elaine Odgen. These cookies don’t require a ton of ingredients, they do use butter flavoring and personally, I’ve never had a cookie with cornmeal in it. I altered the ingredients slightly, swapping butter for the shortening, adding brown sugar, increasing the amount of butter flavoring, and increased the yield, but I’m sure these would be fantastic as originally written. Preheat oven to 350. Cream together butter and sugars. Add egg, butter flavoring and vanilla and stir well. Mix together flour, baking powder and cornmeal and add to batter. Stir until combined. Drop by spoonsful onto ungreased baking sheet. Bake about 7 – 9 minutes, or until bottoms just start to brown slightly. 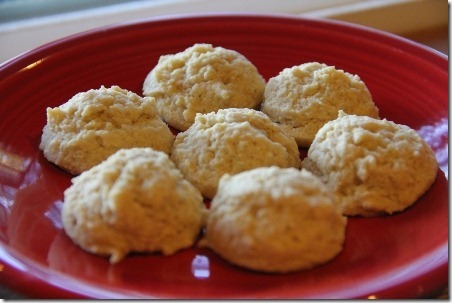 These remind me of cornbread, but a little sweeter and with a cookie texture. And for the record, I do eat food that isn’t cookies sometimes. Honest.